Note: This example will demonstrate how to configure a LAN-to-LAN IPSec VPN tunnel between two D-Link DIR-130/DIR-330. Step 1: Open your web browser and type in the IP address of the DIR-130 router (192.168.0.1 by default). Enter the username (admin by default) and password (blank by default), and then click OK. Step 2: Click on SETUP and select VPN SETTINGS. 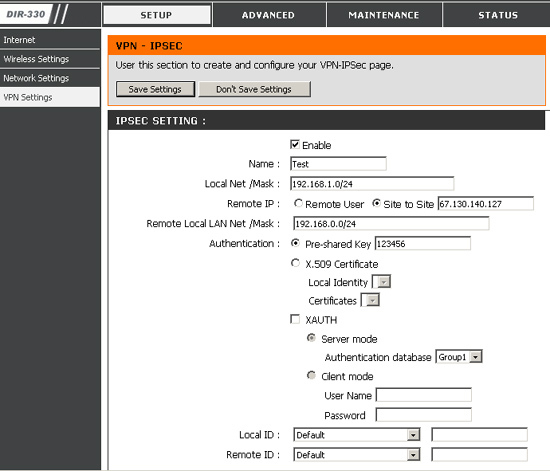 Choose IPSec from the ADD VPN PROFILE dropdown menu and click Add. Phase 2 IPSec Proposal List: leave as is. Note: Both sides cannot be on the same subnet.